Rainbow Trout meat is mild, with a delicate, nut-like flavor. The flesh is tender, flaky, and soft. ﻿Rainbow trout is one of the few farmed items we carry. This industry dates back to the 1880s, in the pacific northwest. Today Idaho accounts for 70 percent of the rainbow trout industry. These trout are pure, clean and taste wonderful. The flesh of the rainbow trout is white, pink or orange. When the meat is cooked, it has a delicate flake and the color pales. rainbow trout with strong sauces. A little butter, lemon, and parsley are usually all you need to bring out the delicate flavors of this fish. Place the planks into cool water and allow to soak for at least 2 hours and up to overnight. 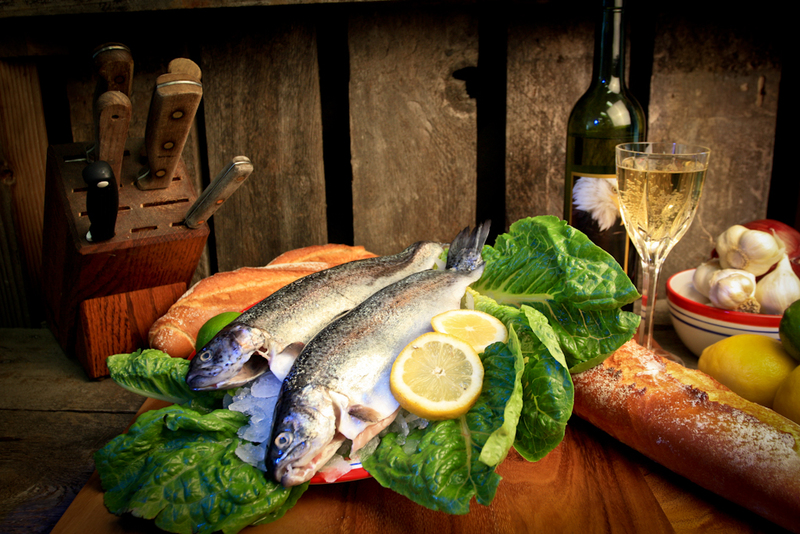 Preheat the grill to 375 to 400 degrees F.
Brush the trout, inside and out with olive oil. Season inside and out with salt and pepper. Place the trout onto the planks belly down and open. Place the planks over indirect heat and grill until the fish reaches an internal temperature of 120 degrees F on an instant-read thermometer, approximately 15 to 20 minutes. Remove from the grill and allow to sit for 5 to 10 minutes before serving as is or deboning and serving.